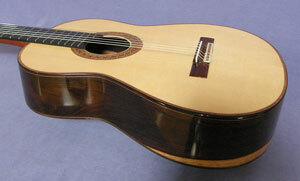 The size and shape of this guitar is the same as my models influenced by Antonio de Torres. However the bracing is quite different: the European spruce soundboard is thinner and is supported with my own development of a rectilinear-quadrate patern of struts. 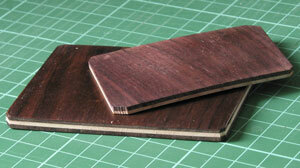 The sides are of a double laminate and the back of a triple laminate as can be seen in the description below on the left. 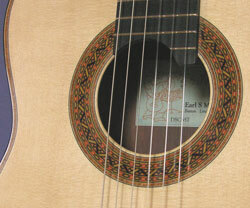 A guitar with exceptional projection and beautiful tone with clear fundamentals, good sustain and a wide palette of colour. 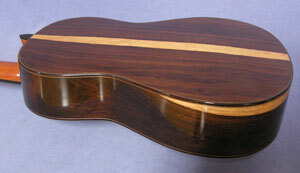 Rosewood head veneer individually carved. 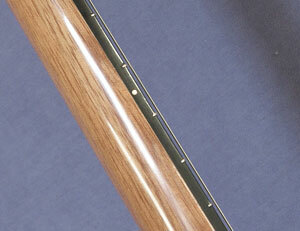 The Brazilian rosewood bridge has six double holes in the tie block providing for good break angle of the strings.